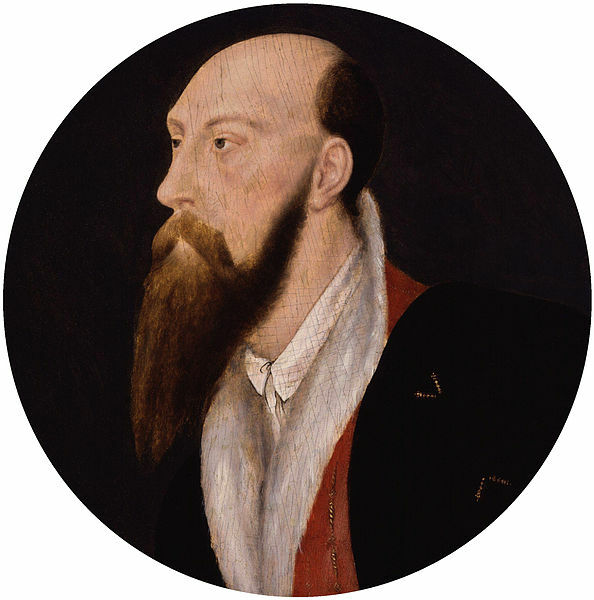 Sir Thomas Wyatt the Poet | I'm writing a book on Sir Henry Wyatt, his famous son and his infamous grandson. This is bits and pieces of cool stuff I'm finding along the way. Last week an Irish Facebook friend and Tudor enthusiast suggested we put more art on Facebook. He asked me to post something about Hans Holbein. I began with Holbein’s famous painting of Henry VIII, but couldn’t resist – I had to share family members painted by the great man. 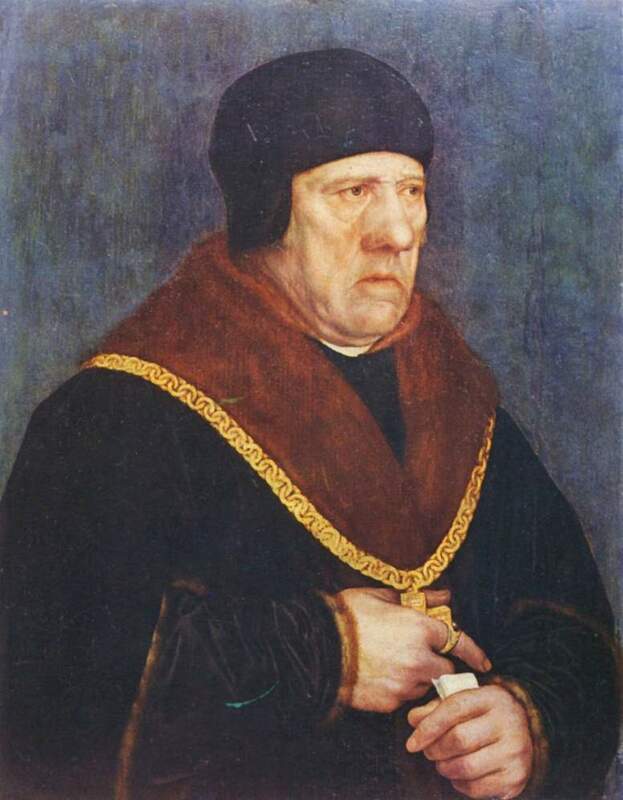 I’ve noticed some of the people who sat for Holbein seemed somewhat awkward about or uncomfortable with the situation. 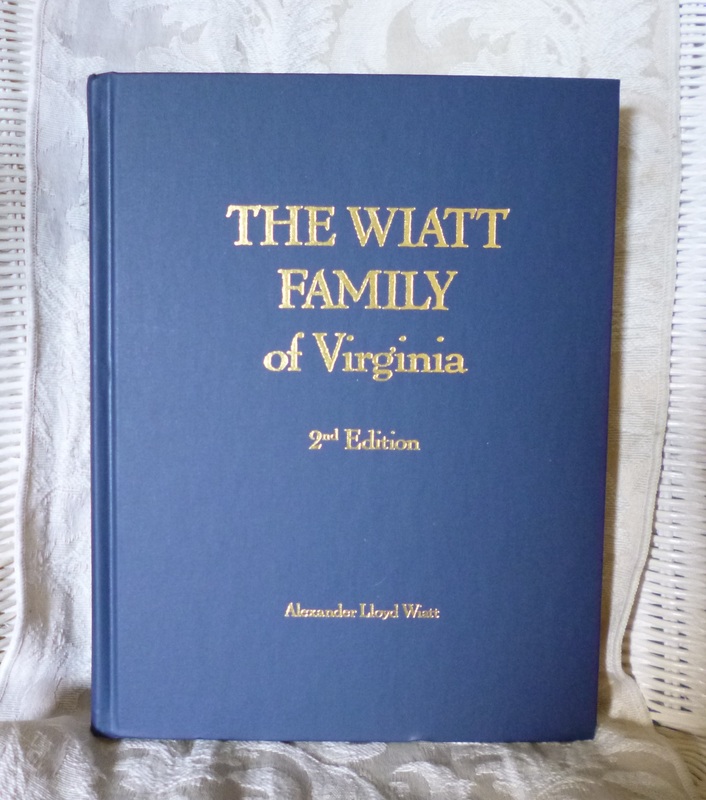 I am most haunted by our Sir Henry Wyatt. His painting is oil on oak, only 15.4″ x 12.2.” According to Wikipedia, which does a nice job of documenting the art they share with us, it’s in the Louvre Museum, on the second floor, room 8. This is the face that endured the application of horse barnacles during torture ordered by Richard III. 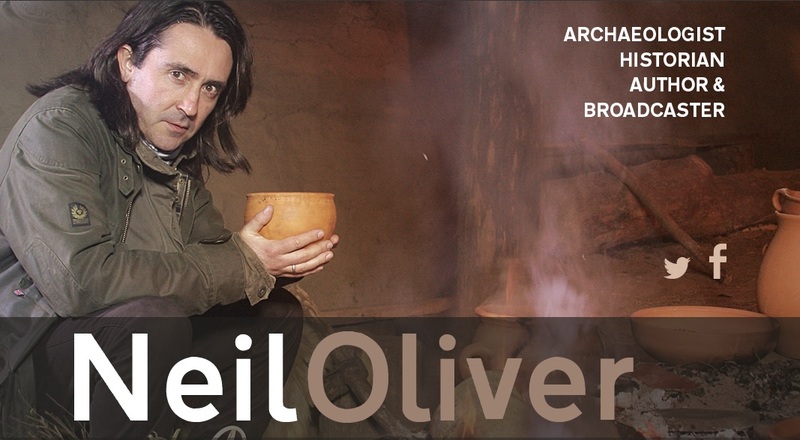 He was only 23 when imprisoned and locked away until the Battle of Bosworth in 1485. He lived with that face for a long time. Experts think it was painted around 1537 – around the same time as his son’s portrait and very near the time of his death. Sir Henry was born in 1460, died at 76 or 77 on 10 November, 1537. He would have been around 34 in 1537. 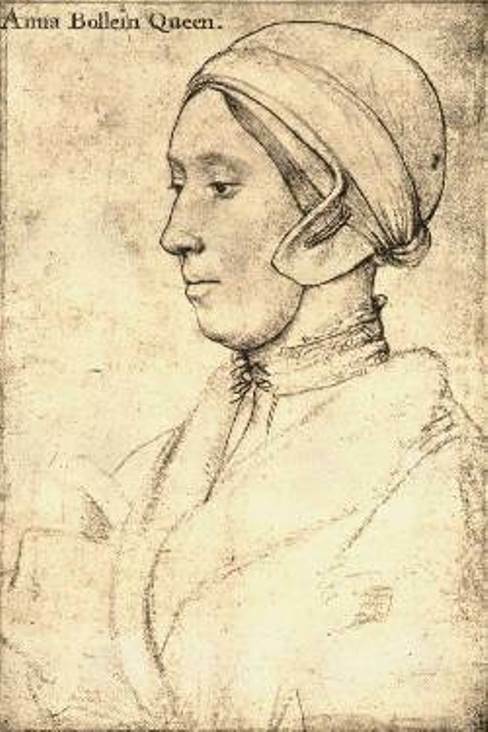 Wikipedia tells us this is “Black and coloured chalks, pen and ink on pink-primed paper, 37.3 × 27.2 cm, Royal Collection, Windsor Castle.” One of my books (Holbein by Jane Roberts) says it was “Black and coloured chalks and ink applied with pen and brush on pink prepared paper 37.1 x 27 cm.” We’re told Holbein also drew a profile portrait. 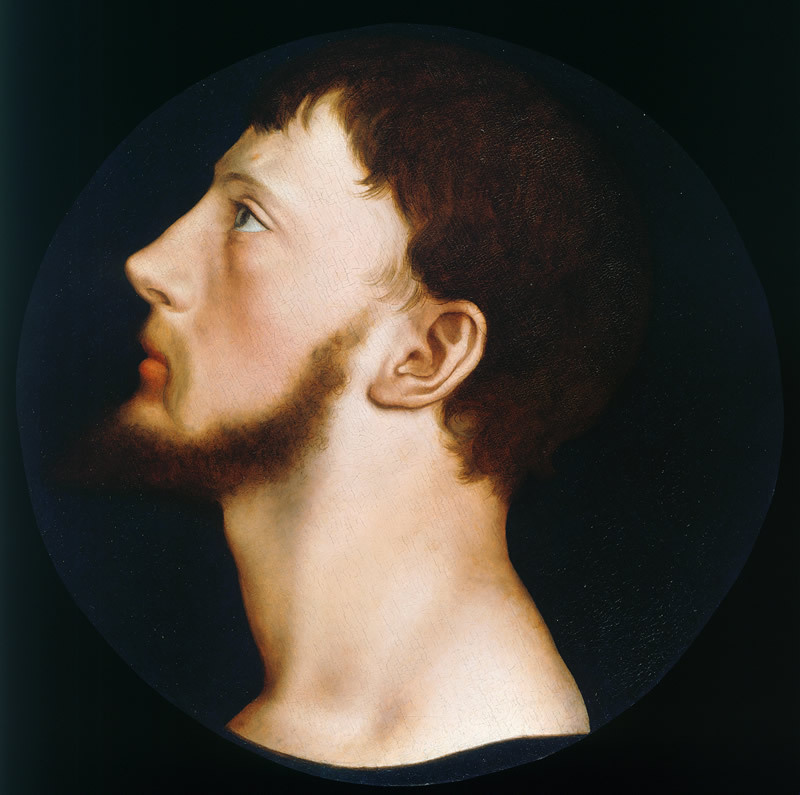 Sir Thomas Wyatt was born in 1503 at Allington Castle; he died at a friend’s house, age 38 or 39, on 11 October, 1542. This is Margaret Wyatt, Lady Lee – Sir Henry’s only daughter, Sir Thomas’ sister, dear friend of Anne Boleyn. Apparently Margaret was also known as Mary, so Wikipedia is confused about “which sister” was Anne’s loyal Lady in Waiting. She looks so different from her father and brother, I wonder if she took after her mother – Anne Skinner. 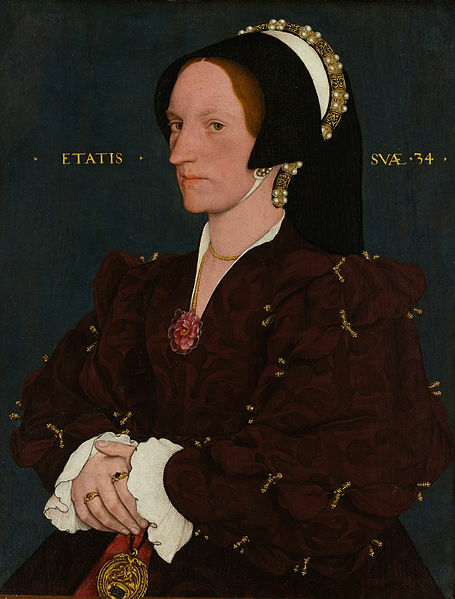 Some think this Holbein may be Elizabeth Brooke, wife of Sir Thomas Wyatt the Poet. Her brother was George Brooke, 9th Baron of Cobham. Do we see a resemblance? I think so, but it’s hard to say. 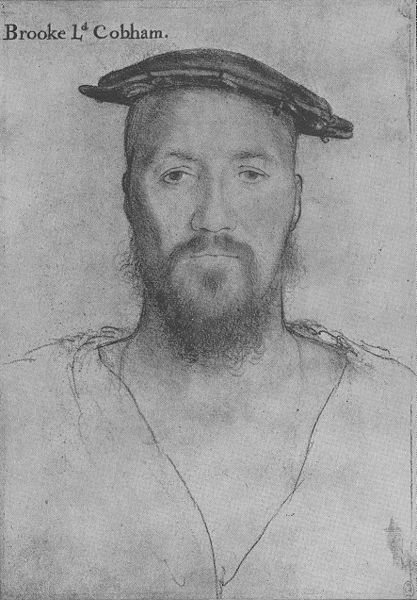 Sir Thomas Wyatt’s brother-in-law took part in the trail of Anne Boleyn and got caught up in his son’s rebellion against Queen Mary. 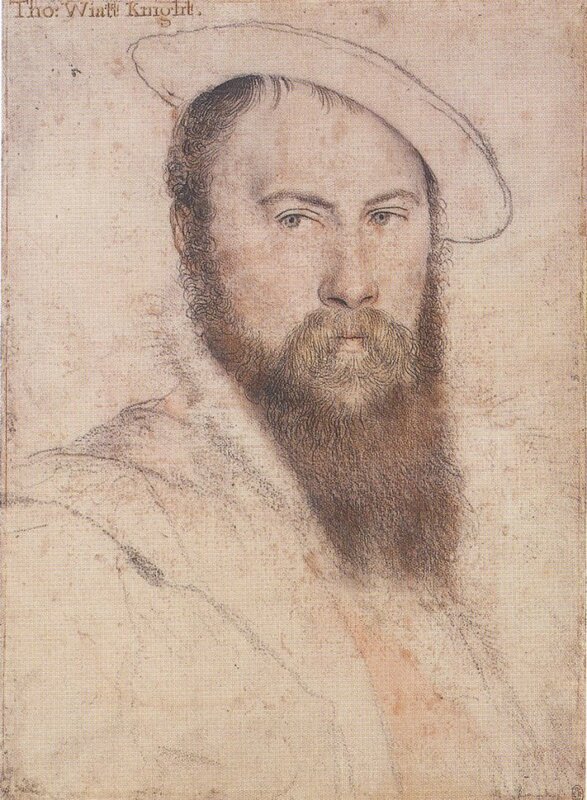 Sir Thomas Wyatt the Younger was born in 1521. 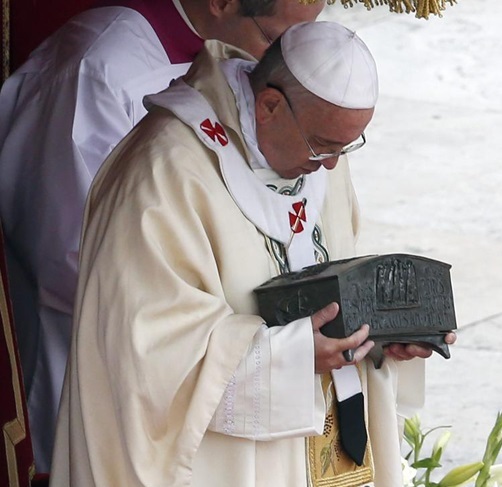 He was about 15 or 16 when his grandfather died, 20 or 21 when his father died. He was one of the leaders of the rebellion opposing Queen Mary’s desire to marry Philip of Spain. Henry’s grandson was executed at 32 or 33 at Tower Hill on 11 April 1554. Other close friends of Sir Thomas Wyatt the Poet were painted by Holbein, but let us not end this post without adding the Wyatt family’s powerful friend Thomas Cromwell. Painted between 1532 and 1533, oil on oak panel, 30.9 × 25.4″. Our famous grandfather died 11 October 1542. I wonder if he’d be honored to be so well loved and so well remembered. Let’s look at his last three years. The fates of families were intertwined in the Tudor court. 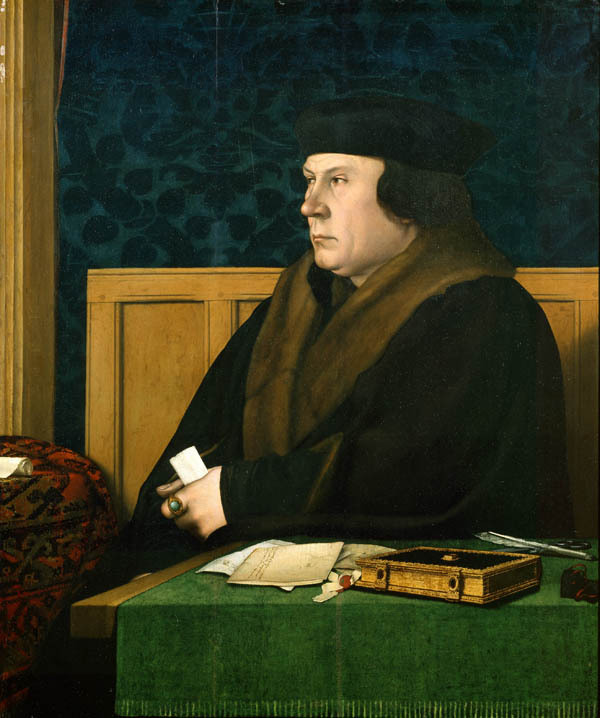 Our family was tied to Thomas Cromwell, the second most powerful man in England. In 1540 Cromwell made the mistake of matching Henry VIII with Anne of Cleves. It was a political match for the good of the country; but the king’s head was bent on romantic ideals. Henry’s EXTREME disappointment gave Cromwell’s enemies the edge they needed to effect his downfall. In May of 1540, Wyatt (serving as ambassador to the Charles VI, Holy Roman Emperor in Europe) nearly begged to be allowed to come home. Taking a last long look around, Cromwell spotted his old friend Sir Thomas Wyatt the Elder in the front ranks of the shifting and pressing crowd. 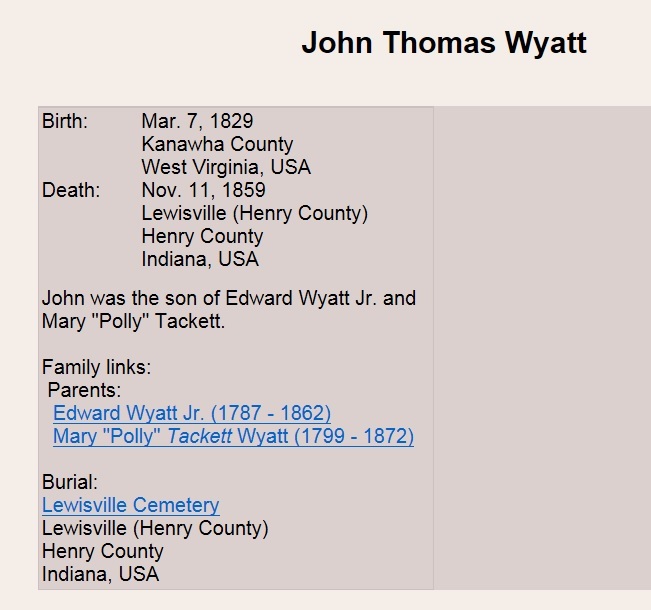 He called out: Gentle Wyatt, goodbye – pray for me. Wyatt imprisoned in the downfall of Anne Boleyn, immediately dissolved into tears. ‘ Do not weep’, Cromwell added, ‘for if I were no more guilty than you were when they took you, I should not be in this pass’. With that, he told the executioner: “Pray, if possible, cut off the head with one blow, so that I may not suffer much’. It was a faint hope. The headsman was called Gurrea, ‘a ragged and butcherly wretch’ and moments later he botched the execution; some claimed he was deliberately chosen because of his lack of experience. It seems likely that his axe stroke missed Cromwell’s neck and bit deeply into the back of his skull; one account grimly talks of two executioners ‘chopping the Lord Cromwell’s neck and head for nearly half an hour’. Bishop Bonner renewed old attacks on Sir Thomas; the powerful Cromwell wasn’t around to protect him any longer; and the king’s health was such that he was increasingly paranoid, more open to believing lies about loyal friends. SIGHS are my food : my drink is bitter tears. Clinking of fetters would such music crave. Stink and close air away my life it wears. Pure Innocence is all the hope I have! Rain, wind, or weather judge I by mine ears! Malice assaults that Righteousness should have ! But yet, alas! the scar shall still remain! In July of 1540 Henry annulled his marriage to the physically undesirable Anne of Cleves (on mutually acceptable grounds) and hooked up with a sweet young bubblehead. His new queen, Katherine Howard, was a cousin of Anne Boleyn and our Elizabeth Brooke. Let it be said that the king was no prize. His old jousting wound had never healed and you smelled him before you saw him. Previous injuries restricted most activities except boffing and eating; he was immense and getting old before his time. The king granted his release from prison on the condition that he would take his wife back. Understand that they had already been separated for about 15 years. 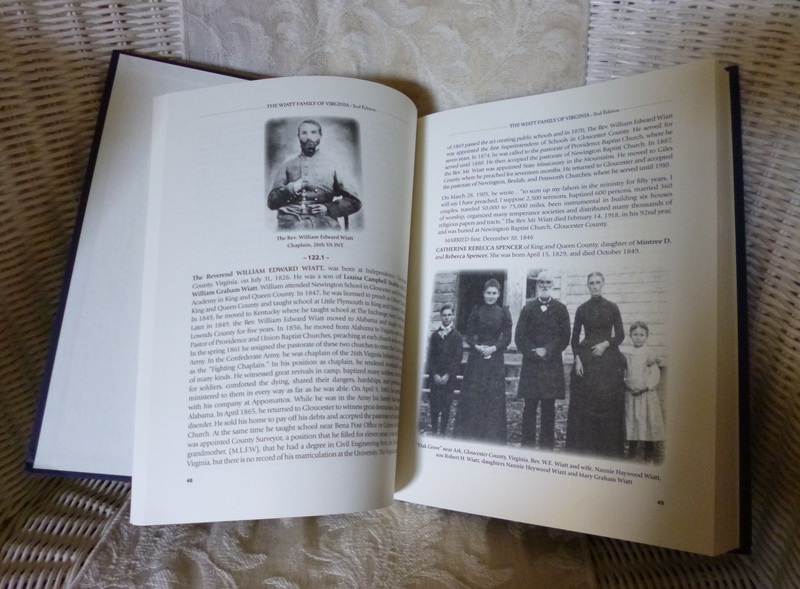 Henry expected Thomas to live a “conjugal” life with her; if he didn’t – if he was found to have relations with others – he would suffer death and confiscation of property. Shulman suggests Henry may have given in by pressure from the Howards – relatives of the Brookes, who wanted Thomas to accept financial responsibility for his estranged wife. They’d been after him to pay up for years. Is it possible Henry gave him a wink and a slap on the back? If not, he was risking tremendous wealth for love. Because Henry did what he had done before after imprisoning his old friend for no good reason; he added to his estates and allowed him back into his circle of trust. When Henry beheaded his young queen for adultery, Thomas acquired the lands of her lover, Thomas Culpeper. The following year Henry refriended Spain and resumed war against France. 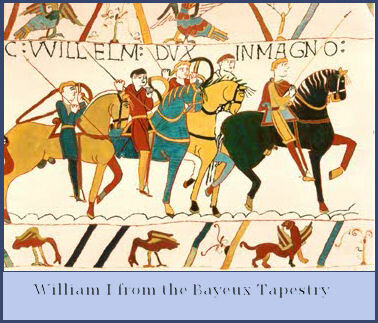 Thomas accompanied the king at Dover and was made captain of 300 men in Calais, where he defended the city while new fortifications were built. Sir Thomas was expected to be named Vice-Admiral of the English fleet. When the Spanish envoy arrived in Falmouth ahead of schedule, Sir Thomas rushed to meet him, changing many horses along the way. He was known to have crushing headaches. He wasn’t feeling well, the sun was bright and the weather unseasonably warm for October. Shulman quotes his friend John Mason as gently accusing him of “having more regard for the royal mandate than his health.” Shulman says there was another reason for his speed. Elizabeth Darrell and their young son were nearby. He collapsed of great fever at the house of his friend Sir John Horsey. Shulman hopes he sent for Elizabeth so they could say their final good-byes. (34 Hen. VIII, Kent, m. 90). 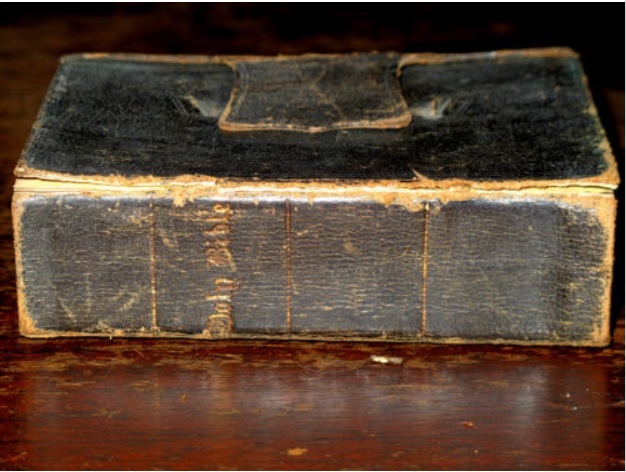 Sir Thomas left some of his properties to Elizabeth Darrell with “right of reversion” to their son Francis. During the reign of Queen Mary, Elizabeth Darrell finally received the legacy left to her by her beloved Queen Catherine of Aragon. (It had been withheld by Henry VIII.) According to Tudorplace.com Elizabeth Darrelle married Robert Strowde in 1554. 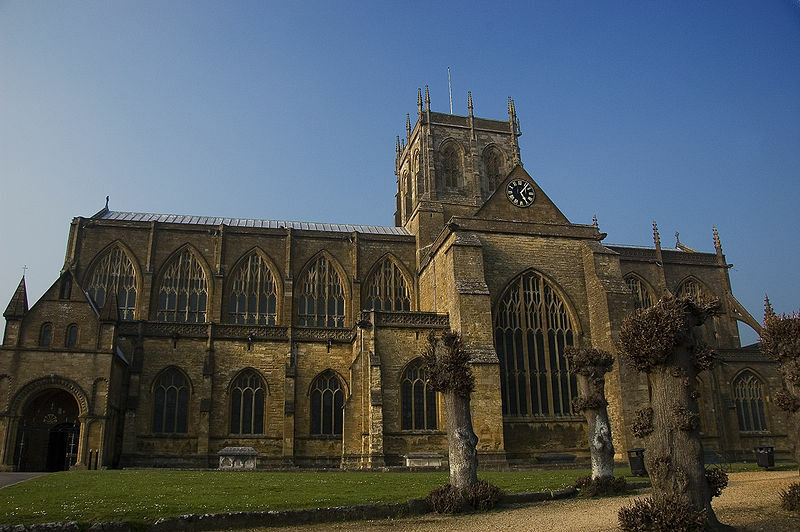 Elizabeth Brooke – finally free – married Sir Edward Warner, Lord of the Tower. 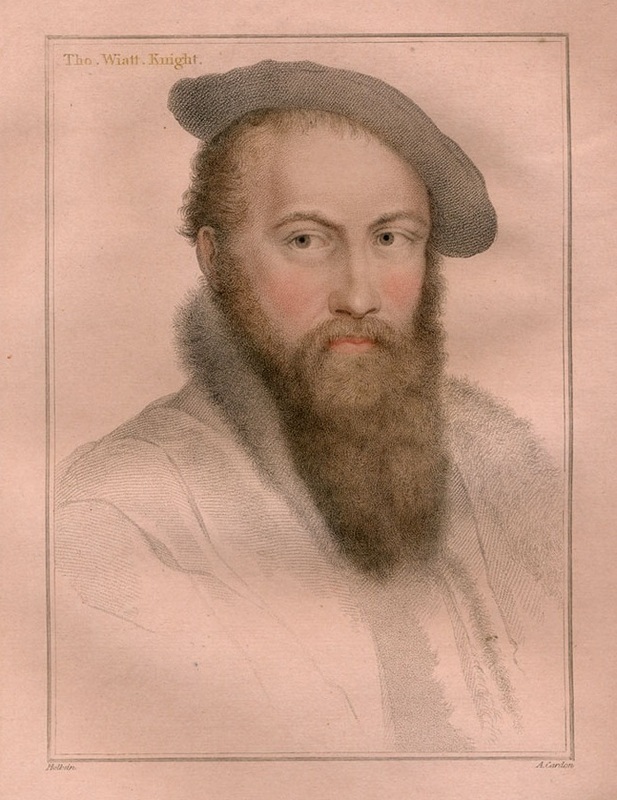 Warner was implicated in Sir Thomas Wyatt the Younger’s rebellion; when Elizabeth became queen, she restored his position and family fortunes. Elizabeth and Edward died during the reign of Queen Elizabeth.